This is a classic soup I grew up with. It is in fact a soup that my mother still makes routinely from time to time throughout the year. In the fall and winter months though, this soup would be found in my mother’s soup pot more frequently, as those would be the months when the radish and daikon are in season. This soup is also very common in many Chinese households. This is because the soup is so easy to make, so nutritious, and tastes so good. 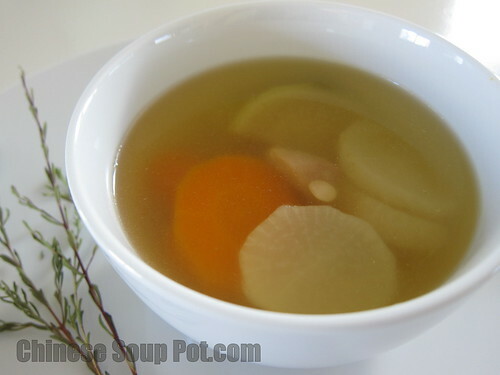 The soup is known to assist with digestion and upset stomach. 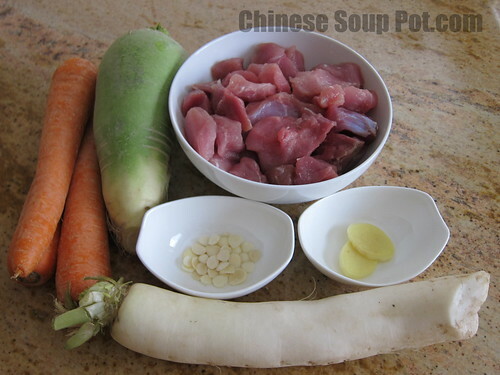 The combination of radish, daikon, carrots and pork provides this soup a very comforting sweet taste. The green radish in this recipe yields a very special flavor that I just love. My mother did not have to force me with eating my vegetables when this soup was made. I would just eat the vegetable roots on my own with this soup – something I’m sure my mother was very happy to see. On top of that, this soup is very affordable to make. I bought all of the ingredients for this soup at an Asian supermarket for under $6! And the portions are enough to make 8 servings, making this a great appetizer soup when you have a large crowd to entertain at home. This soup is so popular that you will sometimes see it served as a complimentary appetizer on the house for loyal customers at some Bay Area Chinese restaurants. I have certainly received my share of free soups at some of these restaurants. And I am always happy when the complimentary soup is this one. Boil a small pot of water to blanch the pork. Cut the meat to 2-inch cubes while the water cooks. Blanch, drain and set aside the pork. In a separate large pot, boil 10 cups of water. Peel and slice the green radish, daikon, and carrots to 1-inch thick slices. Rinse the Chinese almonds and set aside. When the soup water boils, put all ingredients into the pot. Cook covered on high heat for 5 minutes or until the soup water boils. Reduce the heat to Low and simmer for 2 hours. Set the timer. When ready, sprinkle a pinch of salt to taste and serve. Green radish is said to be a cooling food. As such, pregnant women and those with a cold should drink this soup with caution. Hi! This looks really yummy and a great alternative to the traditional chicken noodle soup. I also like it that it aids digestion, which for me, is always a bonus!! never realised there’s a green radish before! I often make a similar version with just the daikon and carrot and shiitake mushrooms. don’t dare to add any herbs as I heard daikon/radish is very cooling and will negate the effects of any herbs. is that true? oh well, thanks for sharing this! your soup looks so perfect and clear! I love this one. Another version is also adding dried red dates, goji berries and a few slices of dried squid that give this soup some nice and complex flavours. This soup sounds really wonderful, and I’m sure I’d love it! I feel I use radish much too less, and I think this is because it’s used just for salad over here, never cooked. I want to experiment more with it!